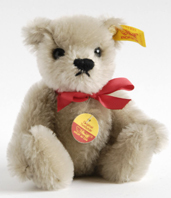 Miniature bears are bears up till 20 cm. / 8" tall. Material: pink mohair, fully jointed. 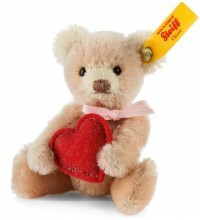 This miniature teddy bear is made by Steiff in 2013. He is 10 cm. / 4" tall and made of cream colored mohair. He is 12 cm. / 4.8" tall and made of black tipped aubergine colored mohair. He is 12 cm. / 4.8" tall and made of black tipped green mohair. This bear is 14 cm. / 5.6" tall. 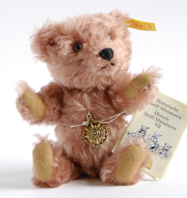 He is made of brown mohair and is a small edition of the 55 PB from 1902. 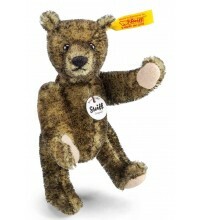 He is made by Steiff in 2002. He is made of natural white alpaca. He is a small edition of the Petsy issued in 1970. 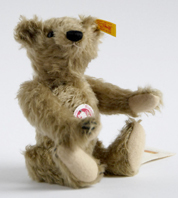 He is a small edition of the bears issued in 1980. 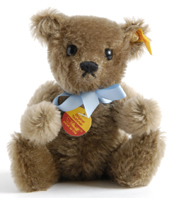 He is a small edition of the Millennium Bear issued in 1999. This bear is 16 cm. /6,4" tall. 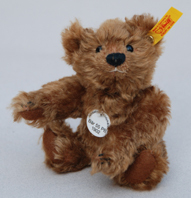 He is made after a bear that was issued in the USA in 1995. This bear is 15 cm. /6" tall. 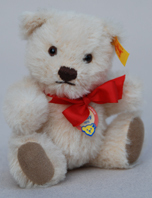 He is made by Steiff in 1990. He is made after the first movable bear.